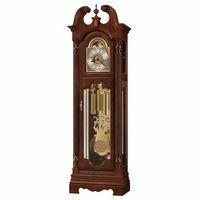 Beautifully styled Hermle tambour-style clock in a cherry finish with brass feet, raised burl veneer panels and a beaded molding across the base. 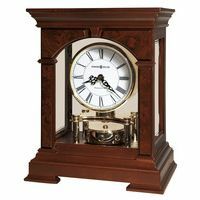 Outfitted with a dual-chime quartz movement plays 1/2 hour Bim-Bam or 4/4 Westminster chime with volume control and night shut-off. Uses 2 Size C batteries. 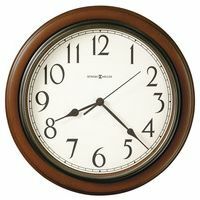 (Note this clock does not come with winding holes pictured).